Swarm intelligence has become an intensively studied research area in the last few years. Gathering of mobile robots is one of its basic topics that aims the assembly of the scattered robots on the smallest possible area. In this chapter, we present a new and effective algorithm for this task supposing an obstacle-free plan, limited visibility, and synchronous, fat (disc-like) robots without global navigation, communication, or memory. The key idea of the algorithm is that in case of each robot after detecting the visible neighbouring robots it sets the target of the next step based on the encountered visible robots’ center of gravity. 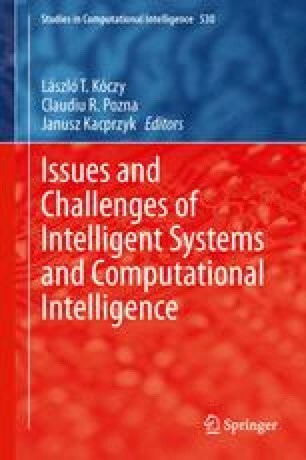 The new algorithm was successfully tested using computer simulations for several parameter and swarm size values and it achieved similar or better performance as the studied previously published algorithms in all of the cases. This research was supported by Kecskemét College GAMF Faculty grant no: 1KU62, and the National Scientific Research Fund Grant OTKA K77809.